Since 1982 Flowquip have been supplying bespoke flow meter solutions for liquids, compressed air, gas and steam to a vast number of industries including Chemical, Oil and Gas, Process, Petrochemical, Energy, Water, Food and Beverage. Our flow meter solutions include the latest technologies such as Ultrasonic flow meters, Electromagnetic flow meters, Thermal Mass Flow meters, Coriolis flow meters, Variable Area Flow meters, Electromagnetic Flow meters, Vortex flow meters and Turbine Flow meters. In addition to our wide range of stock flow meters we offer complete bespoke solutions encompassing design, supply, installation and commissioning. We also provide flow meter calibration, servicing and repair. Flowquip work closely with the majority of the UK’s chemical manufacturing companies, providing flow measurement based batching, dilution and filling control systems. We offer a concise range of compatible products for both aggressive and non-aggressive liquid chemicals. 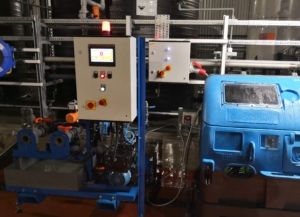 At CHEM UK in 2019, we will be showcasing working version of one of our batching/dilution rigs, along with a selection of flow meters and control instrumentation.